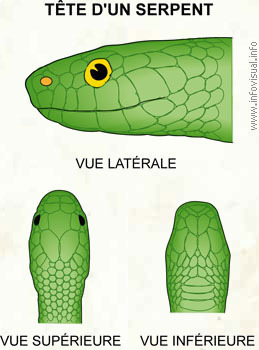 Tête d'un serpent - Dictionnaire Visuel - Copyright © 2005-2016 - Tous droits réservés. [img]https://infovisual.info//storage/app/media/02/img_fr/017-tete-un-serpent.jpg[/img] [url=https://infovisual.info/fr][/url] - [url=http://www.infovisual.info/]Dictionnaire Visuel[/url] - Copyright © 2005-2016 - Tous droits réservés. Emerald tree boas are typically a shade of emerald green in color with a white irregular zigzag stripe down the back and a yellow underside. The bright coloration and markings are very distinctive among South American snakes. The emerald tree boa is a nocturnal carnivore. During the day, the snake typically coils itself on top of a branch, with its head perched at the center. However at night, it will remain coiled on its branch, but will extend its neck pointing beneath it, curled as if about to strike. It will then hold still in this position, waiting for prey to approach directly underneath it.